The Kidliterati Ten is an interview series with young readers. We ask them about a favorite book and hope you enjoy the answers. Liliana. 11. My favorite ice cream is chocolate extreme. I think that’s what it’s called. It has a LOT of chocolate. 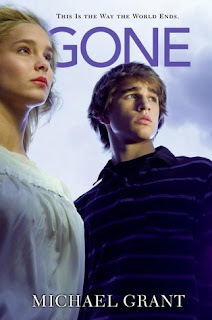 I read GONE by Michael Grant. I chose it because it was in my English teacher’s room and I liked the description on the back. [Spoiler alert] When Sam saves his friends and kills the coyotes. That was the first real time we used his power. [laughs] Probably break down, maybe, then try to round up everyone I could find. Definitely breaking down first, though. My parents and big sister would be gone. I think that’s pretty break-down worthy. I would say it’s the perfect blend of action and adventure. It kept me reading and reading until really late. Don’t tell my mom. It gives the right mood. Would you want to read a similar book? Why or why not? Yes. Books like this are now very, very high on my list. Actually, no. It’s very unique. It has it’s own power. Did you come up with any other acronyms for FAYZ? Was that your first choice? In the blink of an eye, everyone disappears. Gone. Except for the young. There are teens, but not one single adult. Just as suddenly, there are no phones, no internet, no television. No way to get help. And no way to figure out what's happened.